Few things can spark a memory like the smells that come from your kitchen... Certain foods can take you straight back to a moment, a memory, a time that you may have long since forgotten. As a kid one dessert we would often have for holiday meals was "Egg Pie". It was something my Nannie Black would make often. I'm sure for one reason was because it was easy, it was fairly inexpensive, and finally because we asked for it all the time! When talking about the Thanksgiving meal this year, the dessert menu was brought up and my sister asked for "Nannie Black's Egg Pie". I jumped at the chance to make it. Come to find out, I was the only one who had her recipe still... I am so thankful one of us still had it. And even better... I had a book that had it in her own handwriting. 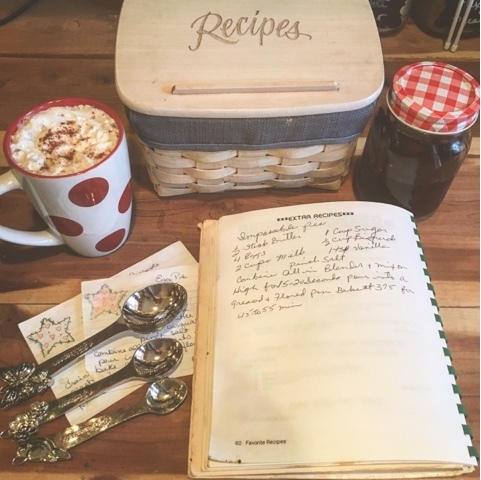 As I gathered the recipe and ingredients that day for baking, my heart was pricked and tears welled up in my eyes, remembering my little Nannie. She was a little woman, she loved plants, and baby animals, she liked to cook, and she lived cautiously. Anytime you would go over to her house you could find the sales papers laid across the kitchen table. Coupons cut, weekly deals circled and usually some type of seed that she was saving drying on some paper towels. I sure do miss her. What is egg pie you may ask? It's one of those old fashioned desserts. It's not super sweet. It's kinda jiggly, like custard. We eat it hot. We eat it cold... we would probably eat it in a pot, nine days old... if it ever lasted that long. It was so good I made it for two of the Thanksgivings we went to. When my Daddy took a bite, he said it took him right back to his grandmas kitchen. And it was just as good as he remembered. When I made it for my Mom's Thanksgiving, we all remembered Nannie and her egg pie and our kids tried it for the first time. Some loved it. Some not so much... but it's like I said to them, when there is so many more SWEET things to choose from, egg pie may not seem like much. Super sweet peanut butter pie, brownies, cupcakes usually will win with kids hands down. 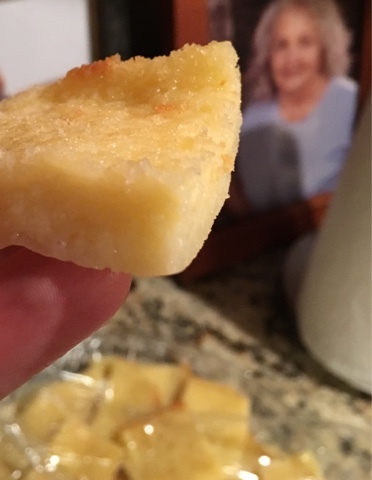 Egg pie is a humble, simple dessert. How fitting that I snapped this picture of what egg pie looks like for a friend of mine.... I didn't notice it at the time, but that's a picture of my Nannie Black in the background. Put all ingredients into a blender, blend for about 20 seconds and pour into a greased and floured 9x13 casserole dish. Bake at 375* for 45-55 minutes.